Have I been to The Slanted Door? No, well yes. Well, yes and no. Long before I lived in San Francisco, or even America for that matter, I read about Charles Phan and his Mission-district Slanted Door restaurant in a British Food Magazine. Needless to say, my appetite was whetted and when I found myself spending a little long-weekend vacation in San Francisco in the late 90's I made sure I paid Charles' famous eaterie a flying visit. I don't remember the slightest detail about the food I consumed on that occasion. The only thing I recall about the entire evening is my embarassing bathroom saga. In those days I would have called it a toilet saga but I am since Americanized enough to have left all toilets behind me. On that night I was wearing some bright red satin pants. No, I mean trousers. (What my pants looked like is absolutely none of your business). The trousers were made from chinese fabric, embroidered with little flowers. Cute. At one point I was a little bit desperate and off I went to find the bathroom. As I recall, there was just one, at the back of the restaurant, up a couple of little steps to the left, door on the right, near the kitchen. It was nothing fancy. I locked the door behind me and proceeded to try and undo my zip. I tugged, I wrestled, I pleaded, I coaxed, I eased, I begged, I think I even even prayed. Nothing would budge that wretched zip. It just would not slide, not even a millimetre. I think I was in the john for at least 15 minutes trying everything I could think of to get out of my pants. No such luck. Nothing whatsoever worked. Eventually, I gave up and decided to return to the dinner table where I would simply have to cross my legs and come up with another plan. The most excrutiatingly embarassing moment of all was when I opened the bathroom door to find that approximately half of the guests in the restaurant were politely queueing up outside the door silently begging for me to be done with my business. Not that I had even had the chance to do any business. I felt all their eyes studying, nay piercing, me as I exited, each of them wondering exactly what I had been up to, in there, for so, so long. My blushing cheeks turned as hot a crimson red colour as my pants, erhmm, I mean trousers. 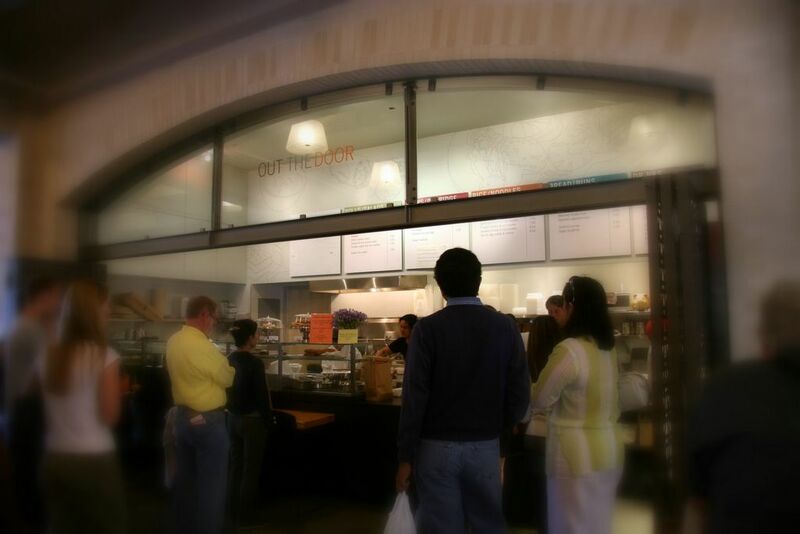 Needless to say, I have been wary of the Slanted Door ever since. Now I am local myself, I sense a love hate relationship between San Franciscan's and one of the area's most celebrated Chefs. 'Sold out', 'gone down hill' and 'overrated' are the kind of sentiments I have seen describe this restaurant in its swanky new Ferry Building location. I did try and secure a walk-in lunch there with a couple of friends a year ago but the wait was just too long. I am not really organised enough or smitten enough to go to the bother of making an advanced reservation, so until now my only perspective on The Slanted Door has been a distant memory that was perhaps better off being forgotten. It turned out that this was nothing like the Crispy Duck I yearned for, but it was delicious nevertheless. The meat was tasty and succulent, the fat was indeed crispy on the outside and flavourful. The meat was lying on a bed of apples and watercress which were shimmering and glistening, having been soaked in the fat dripping from the duck. The broken rice was perfectly cooked, it tasted so creamy, it melted in my mouth. A little carton of brown juice, which I think may have been duck juice, soaked into the rice giving it a powerful savoury flavour. Yum. The Grapefruit and Jicama Salad with Candied Pecans was not as exciting. The sparse scattering of plump juicy supremed slices of pink grapefruit were as sweet and suculent as they could be, but once they'd been eaten the rest of the sald was without any pizzaz. 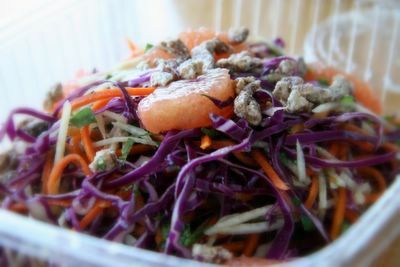 Although the dressing was good, the jicama was pushed out of the limelight by an overwhelming excess of red cabbage and carrot which was more of a chore, than a pleasure, to chew on. The Slanted Door also gets a great write up from visiting Foodblogger, Reid, from Ono Kine Grindz in Hawai'i. Plus - news just in - tips on how to get a table at the SD any time, trouble is you have to be a Restaurant Whore to do so. More on her long, up & down relationship with Charles Phan here. Charles Phan's new Out the Door takeout kits, for preparing a Slanted Door meal at home were announced in the Chronicle yesterday. The Bay Area Bites Blog tested out the shaking beef. You can't help but love a story where someone gets stuck in their trousers.. I guess it would be even worse if you had been stuck in your pants :) The takeout sounds as good as it looks--great pictures! It is so refreshing to hear someone else refer to trousers! People consider me old fashioned but I don't like the "P" word. And what a hysterical story! Sometimes being cute is painful. Out The Door is so tasty and wondrous, I'm glad that people frustrated with the insanely busy Slanted Door can enjoy this little something he has obviously sunk new spring love into! Yes - shuna - i think this will be my method of trying more of his food. I don't need the swanky inside location and reservation hassle, it's the food that's important. I can just sit outside & enjoy, he has empty tables outside afterall. I also wonder if it's ok to take it to the wine merchants to enjoy with one of their glasses? Next time you might want to wear a skirt or some elastic-waistband trousers/pants (I say pants). I'll have to add Out the Door to my list, my very long list. all i can say is that i like a bloke in red suspenders, i mean braces. when i was living on your side of the "pond" there were many things i had difficulties with, like "what's the crack? ", "it's in the boot", "jumpers", and of course "i like your suspenders" said to some business type guy in a dingy pub. luckily being a crass, loud-mouthed american, no explanation was necessary. shunting aside the subject of the slanted door (ho hum hit not really up to the hype), my evil stepmother had a lovely experience in the "pisser" at a fancy restaurant on the occasion of her and my father's anniversary. after the meal she had to take a leak and agreed to meet my dad at the entrance. after she finished her business, as she strutted out she noticed a lot of people turning their heads and staring at her. "well", she thought, "i must be lookin' mighty fine tonight", and she strutted a little bit more. it was only when they were outside the restaurant that my poor old pops told her that that paper toilet seat cover was tucked into the back of the pants and fluttered behind her like the wings of an angel. needless to say she promptly punched him for saying nothing and grinning wolfishly until they had exited the premises. moral of the story: it can always be worse. you could be my stepmother. someday i'll tell the story of the time she tried to prove that you CAN pull a tablecloth out from a fully loaded table without spilling a drop. another anniversary caper. Is this just totally inappropriate--or am I really the only one who is wondering how you eventually got out of your pants--I mean trousers? Your story was hysterical--sounds like something that would happen to me. Thanks for the laugh. 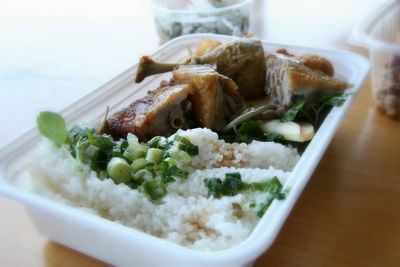 And I can't stop drooling over the crispy duck photo. Yum. I very recently discovered Becks & Posh and am enjoying reading about your gastronomic adventures in my old stomping grounds. Already turned two thrilled Bay Area foodie friends onto it, too. P.S. Happy belated birthday! Ha ha - well - the end of the story is not so dramatic. I sidled back to my seat, and spent the whole dinner, with my hands under the table, just trying to undo the zip (it was on the side not the front luckily). No wonder I can't remember the food, I had no hands available to eat it with! Eventually, after about half an hour it undid and I legged it back to the bathroom. Phew, relief. What a funny story. I was just in SF this time two weeks ago and I ate at the Slanted Door. If you're interested, here's my post. thanks reid - i will add a link to it in my main post. too nad we didnt get to meet you !